Elisabeth Biebl started her career at the Stadtheater in Fürth. In 1940 she moved to the State Theatre in Munich where she was a star during the 1950s and 1960s. She worked there until 1974. She mainly appeared as a soprano in operetta's but could also be seen in several television movies, among them "Die Drei Dorfheiligen" (1949). 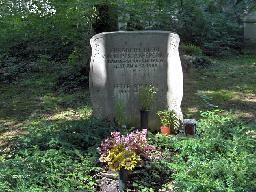 The grave of Elisabeth Biebl at the Waldfriedhof, Munich.